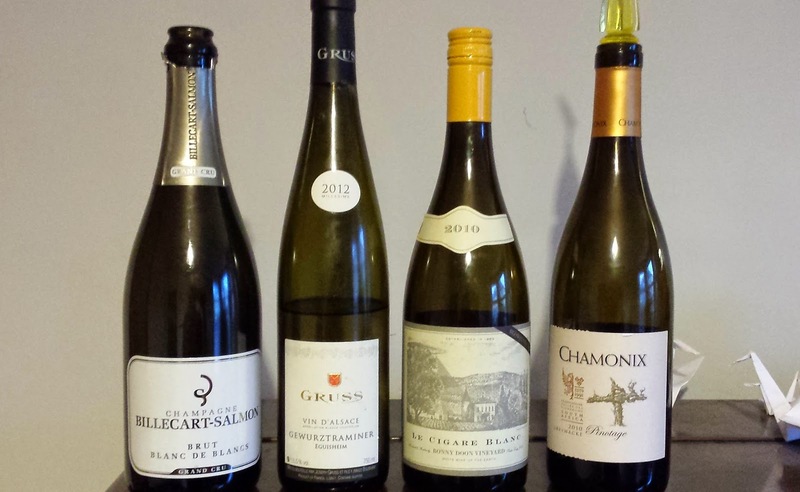 Rather than writing about the more famous wines in the picture above, this evening's post is about the Grüss Gewürztraminer 2012. Grüss is a family-run domaine founded in 1962 at Eguisheim which these days extends to 15ha spread over 42 parcels. The vineyards are managed using the lutte raisonné approach. They don't have a website; my information comes from this page on alsace-vintage.com. This is a very fresh, youthful Gewürz, with plenty of floral notes, citrus, and not much spiciness. There is also some aroma which reminds me of chalk. The common comparison of Gewürztraminer to roses seems very apt here, since the lemony-chalk smell is something I often find in roses. The palate is off-dry (or perhaps medium-dry), mid bodied and not very acidic. Also quite fat, although not quite oily in texture. There's a lovely richness and a hard to pin down woody spiciness, perhaps cloves, reminiscent too of edinburgh rock. This is a very straightforward, decent wine. Less prestigious than its fellows in the line-up above, but a good typical example of Alsace Gewürz.